Nowadays, multimedia responsiveness has become a key concern for every website owner. It is being believed that if your website isn't friendly with multimedia devices, you actually stand a chance to lose potential customers. Well, if you've chosen WordPress to power your website then you're definitely in luck because there's a whole range of stunning themes that can be installed for achieving that brilliant look and feel. The best part of choosing WordPress is that you can install themes that load perfectly on a variety of multimedia devices such as laptops, desktops, smartphones, tablets, netbooks etc. My aim behind writing this blog is to make you familiar with 7 of the amazing Responsive WordPress themes that will add charm to your current WordPress website. 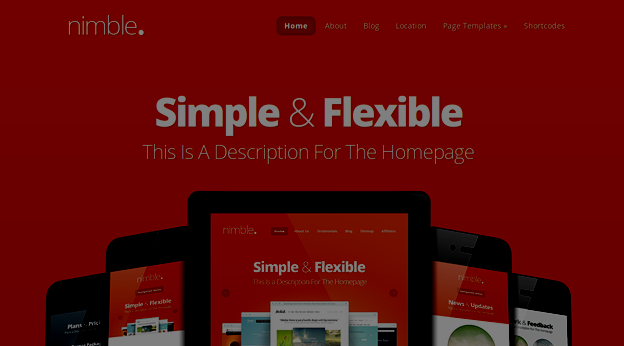 Nimble is an excellent responsive WordPress theme that utilizes CSS Media queries for triggering different types of layouts to fit a variety of screen sizes. The easy to use theme options panel allows you to change your website's look without making any alterations to the code. Packed with features such as custom shortcodes, liquid scrolling, custom typography and a responsive layout, Mercurial is a fully mulmedia responsive WordPress theme specially crafted for WordPress websites belonging to designers, bloggers and photographers. 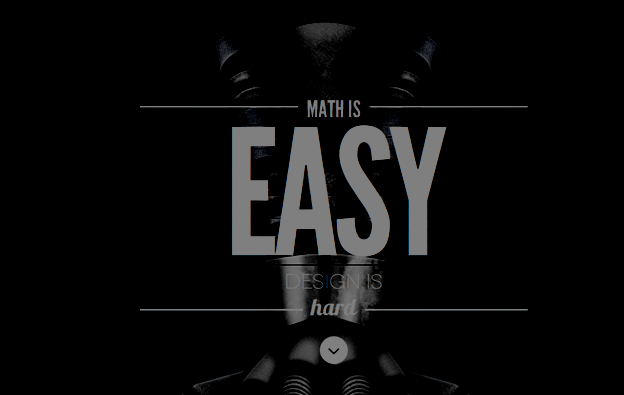 The best part of this theme is its smooth one-page parallax effect. 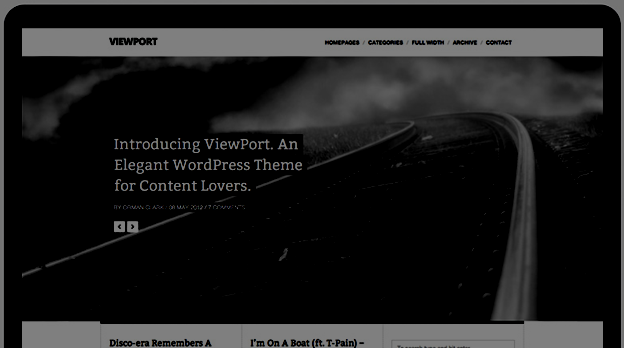 Viewport is a clean, crisp and well-structured WordPress theme that supports audio, video and images. This theme is well suited for WordPress websites that belong to online publishers. With a fully responsive web design, this WordPress theme is a must-have for every website that targets mobile users. 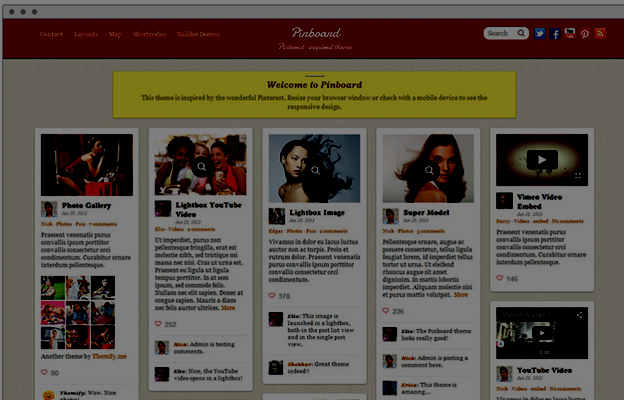 Pinboard is a WordPress theme that's inspired by Pinterest. 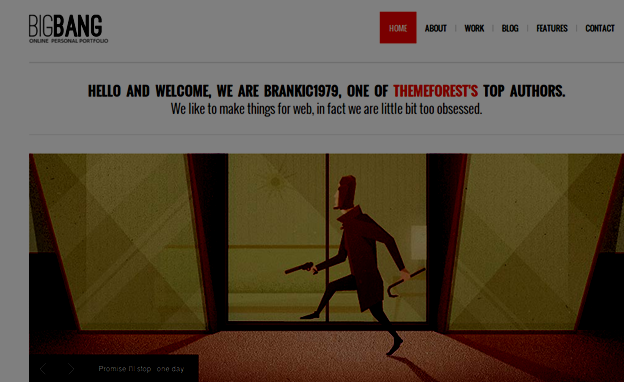 This theme features an auto-stacking layout with infinite scroll. This feature ensures 100% responsive nature of your website and makes the web pages load fantastically on any screen size. Yet another brilliant feature of this WordPress theme is the multisite integration. This feature enables the website users to sign up and post articles/blogs written by them. Pinboard works as a major advantage for WordPress blogging websites that contain multiple authors. Fusion is yet another sleep, bold and contemporary theme that blends fun and professionalism. This WordPress theme utilizes CSS media queries to ensure a fully responsive design for your website/blog. W3c Compliance makes Fusion a must-have for every WordPress website owner who wants to change the design and layout of his/her site on a very frequent basis. 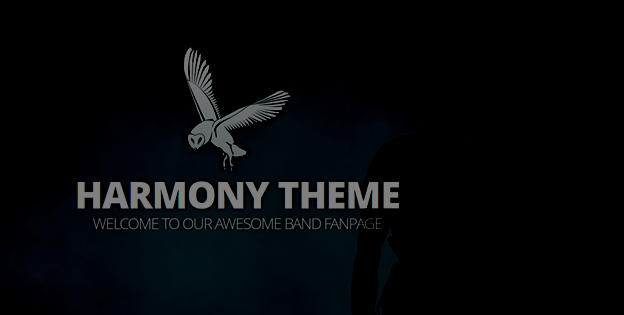 Harmony Band is an incredibly versatile WordPress theme that is tailor-made for websites belonging to musicians and bands. Some of the interesting features of this WordPress theme include an events calendar, song previews, a merchandise store, photo galleries and much more. The big and bold style of Harmony Band WordPress theme can be easily customized to create a brand new look and feel for the website. Since the theme is built using CSS Media queries, it'll look great on tablets as well as smartphones. Bigbang is a clean, minimalist WordPress theme that comes packed with features such as Flexslider, Google Web Fonts, social media icons, photostream widgets, shortcodes and many more. With a wide range of portfolio options to choose from, Bigbang has been able to attain a huge popularity among WordPress users across the globe. 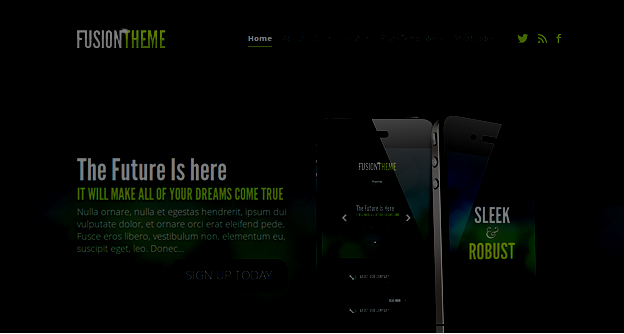 So, that was a list of 7 stunning Multimedia responsive WordPress themes. Hope you'd have loved going the collection and would have chosen one for your WordPress blog/website. Before settling down for a particular WordPress theme, make sure to analyze your requirements well. Doing this will aid you in choosing a theme that will suit your website/blog in the best possible manner. Sarah Parker is a creative web design expert in Converting HTML to Wordpress with vast experience in Research and development vertex of web design technologies with Designs2HTML Ltd. She also use to write about PSD to Drupal Theme Conversion provider in the marketplace and socialize same through social media platforms.